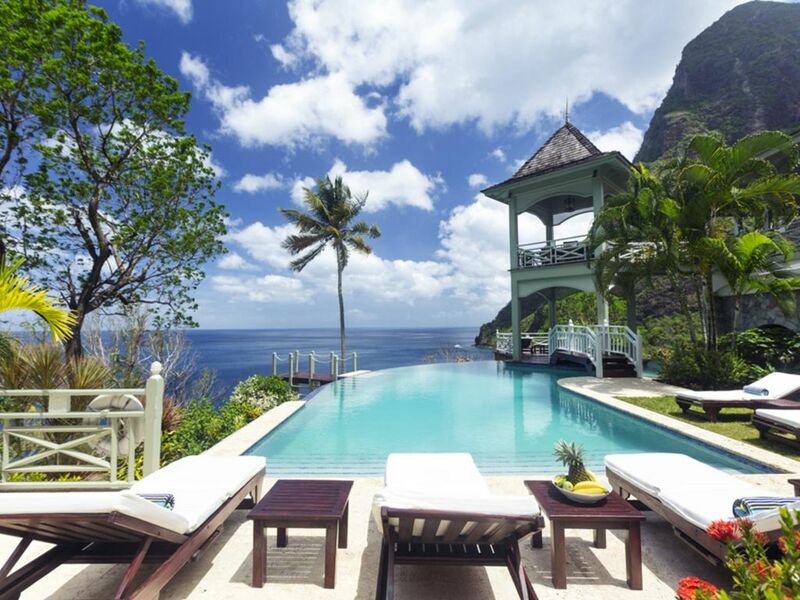 Arc En Ciel is a wonderful property spectacularly situated on Beau Estate, between the World Heritage site of the Pitons. The property is situated above the Caribbean Sea and is a short distance from Sugar Beach and hotel. The nearest town is Soufriere, which is a sleepy fishing village. The area also boasts the drive in volcano, hot waterfalls, diving and snorkeling at Anse Chastanet beach and exotic tropical gardens and mineral baths at Diamond Estate. Arc En Ciel has been imaginatively designed to a very high standard by architect Lane Pettigrew, who has also created the interior design with hand made furniture from Honduras and some select pieces from Tommy Bahama. The house incorporates many aspects of traditional Caribbean style with its verandahs, jalousie shutters and wooden railings. It has been constructed as a number of small pavilions connected by verandahs. The exterior of the house has been partially finished with a facing of hand chipped stones to resemble the exterior of the forts, which were constructed on the island many hundreds of years ago. The house is situated in an extensive, landscaped garden that has a wide variety of tropical flowers and trees. Arc En Ciel has 5 double bedrooms all of which are air conditioned with ceiling fans. Each bedroom has its own TV, DVD and stereo. Bedroom 1 has a queen size bed and a patio with a unique view of Petit Piton. There is an ensuite bathroom, where the wall facing Petit Piton is glass, so guests can enjoy views of this mountain from the bath tub and the shower. There is a private swimming pool and sun deck, that is situated off the bathroom, in an enclosed garden area. Bedrooms 2 and 3 each have a queen size bed, a private patio and an ensuite bathroom with shower and bath tub. Bedrooms 4 and 5, which are situated downstairs and open onto the swimming pool deck, each have two single beds, a private patio and an ensuite bathroom with shower and bath tub. The living / dining room is situated in the centre of the house and is tastefully furnished, the formal dining table can seat 10. This room opens out onto a patio which leads to a spectacular dining gazebo, where guests can dine with the backdrop of the Caribbean Sea and the Pitons. The balance of the entertainment areas are situated downstairs. Here you enjoy the outdoor living of the Caribbean in the large, covered patio with a casual dining area and bar with its own fridge. This leads onto an extensive pool deck and a series of smaller pool patios. The TV room is fully equipped with a TV and DVD player system and is a comfortable, air conditioned family room with two large sofas, one of which can convert into a double bed. The infinity edge pool weaves its way around this area and includes a stone cave with a waterfall. A modern well equipped kitchen at your disposal and laundry room completes the villa.